The team of researchers from the University of Auckland, the University of Cambridge and the Max Planck Institute for the Science of Human History, were able to produce the first conclusive evidence that birds have the ability to plan while using tools by working with New Caledonian crows. The species is famed for its tool-making and problem solving abilities. 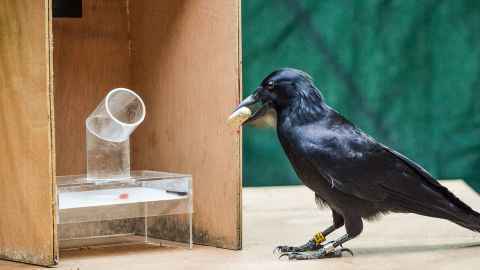 They set up problems to determine if the crows were solving the task on a moment-to-moment basis or were truly planning out a sequence of behaviours before they took on the task. For example, in one problem crows had to use a short stick to push a stone from a tube, and then drop this stone onto a platform to release a piece of meat. They had to do this while ignoring a long stick in a tube, as the long stick did not work in the platform. To make the problem even harder, and ensure the crows were truly planning, only one stage of the problem could be viewed at a time. This meant the crows had to remember where the stone, long stick and meat were and use this information to plan out the correct sequence for a solution. “Because each part of the problem was out of sight of the others, our study clearly shows the birds were capable of preplanning. They were imagining the required steps in advance rather than simply acting on a moment-to-moment basis,” says University of Auckland PhD candidate Romana Gruber.